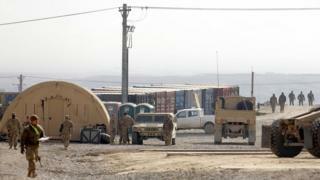 Three US service members and one contractor have been killed by a roadside bomb in Afghanistan. Three other service members were hurt, the Nato alliance said. The explosion occurred near Bagram air base, 50km (31 miles) north of the capital Kabul. A total of seven US military members have died in Afghanistan in 2019. In March, two soldiers were killed. In February, the top US envoy seeking to broker peace in Afghanistan met the Taliban's co-founder in an attempt to end the 17-year conflict.